Months have passed since Hurricane Irma swept across southern Florida with its pulverizing rain and devastating winds. After the floodwaters subsided, municipalities and private contractors started the long process of cleaning up — even today, the work goes on processing all of the wood waste created by the storm. Fort Myers was one of the communities left in disarray. According to Denise Houghtaling, a local resident and owner of MW Horticulture Recycling Facility Inc., area trees suffered the most. The day after Hurricane Irma struck, Fort Myers municipality crews and independent contractors began removing all of the debris from the city’s streets, residencies and commons. At the height of the cleanup effort, county officials estimated that more than 60,000 cubic yards of waste were being moved every day. A majority of Fort Myers’ tree and yard waste found its way to MW Horticulture Recycling Facility, a family-owned organic compost producer serving Fort Myers and the surrounding area. 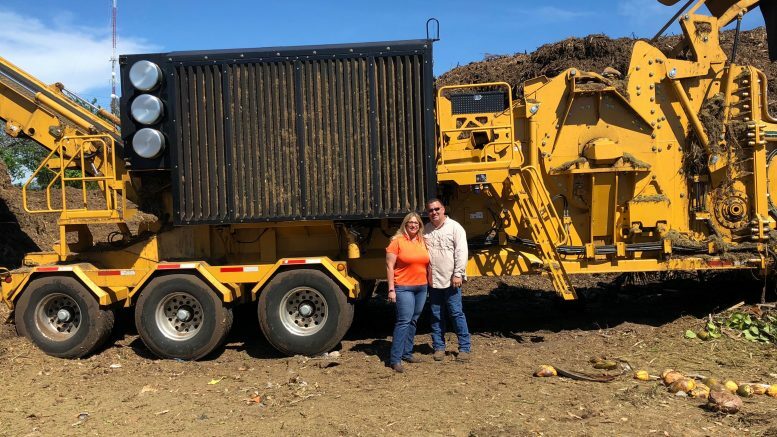 MW Horticulture Recycling Facility was started in 2013 when Houghtaling and her husband, Mark, purchased a bankrupt mulch company and turned it into a successful operation. Today, MW Horticulture Recycling Facility operates two facilities and recently opened a landscape and garden supply depot. The company employs 22 people, including three generations of family members. Before the hurricane, MW Horticulture Recycling Facility’s primary grinder was a Vermeer TG7000 tub grinder and the company used Vermeer TR521 and TR626 trommel screens to separate its various compost, dirt and mulch mixtures. Since September 2017, the company has added a Vermeer HG8000 horizontal grinder. Having quality equipment and support has been important for MW Horticulture Recycling Facility as its team processes all the material brought in after the storm. The majority of the company’s equipment was part of the Houghtalings’ initial investment. 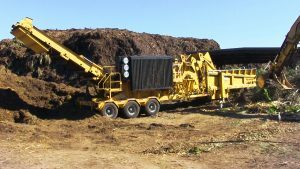 At the time, they didn’t know much about the different manufacturers that produce machinery for the composting industry, but through the support of local equipment dealer representatives, they learned quickly. And after taking a trip to Pella, Iowa, to see the Vermeer Corporation manufacturing facilities and meeting the Vermeer family, Houghtaling was inspired by how much the two families have in common. There is no waste at MW Horticulture Recycling Facility; the team recycles 100 percent of the material it takes in, and they have perfected their composting process. 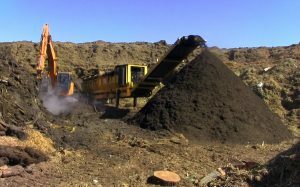 After grinding is complete, MW Horticulture Recycling Facility processes its compost for eight months with diligent watering, aerating and heating. After caring for the composting windrows for eight months, MW Horticulture Recycling Facility screens the material through its Vermeer trommel screen and blends it with other material to produce three different types of compost, including its certified organic blend that is approved by the U.S. Composting Council (USCC) — a veggie blend mixed with peat moss, vermiculite, perlite and planting potting soil made from compost and native mulch. The company also distributes acidic soil, citrus soil, nursery soil, topsoil and a variety of mulches. Houghtaling said the customer base for the company’s end products ranges from homeowners who call for a bag of compost when planting a garden to wholesale manufacturing plants that purchase in bulk and then bag it. “Because our products are organic, our customers know they are getting a very clean end product.,” she added. MW Horticulture Recycling Facility is an active member of USCC, the Florida Nursery Growers and Landscaping Association as well as local construction and building associations. The Houghtaling family also believes in giving back to the community. After Hurricane Irma hit Fort Myers, the company donated its labor to the efforts for several days to make sure its neighbors could get back on their feet as quickly as possible. MW Horticultural Recycling Facility also holds regular gardening classes for adults and children. Houghtaling believes hard work, community support, family and employing the right people, along with having quality equipment, is why MW Horticulture Recycling Facility has been so successful. “There is never a single reason behind success, there are a lot of people involved,” she said. Houghtaling estimates that Hurricane Irma cleanup efforts are still six to eight months away from being complete. Her team and equipment are up for the long road ahead and she looks forward to whatever the future holds for the family and community. This article contains third-party observations, advice or experiences that do not necessarily reflect the opinions of Vermeer Corporation, its affiliates or its dealers. Testimonials and/or endorsements by contractors in specific circumstances may not be representative of normal circumstances experienced by all customers. Vermeer Corporation reserves the right to make changes in product engineering, design and specifications; add improvements; or discontinue manufacturing or distribution at any time without notice or obligation. Vermeer and the Vermeer logo are trademarks of Vermeer Manufacturing Company in the U.S. and/or other countries. Be the first to comment on "Case study: Transforming debris into valuable compost"